Derby Day, a time to celebrate fast horses, smooth bourbon and the Kentucky Hot Brown. That’s right, the Hot Brown, the signature open-face sandwich that layers turkey, Morney Sauce (seasoned white sauce with cheese), bacon and tomato on buttery toast. It’s become the “must have,” along with a Mint Julep for Derby fans, or for that matter, anyone who visits Kentucky. While the Hot Brown is a hot seller during Derby week, it wasn’t invented to feed race fans at Churchill Downs. It was created back in 1926, at Louisville’s legendary Brown Hotel by Chef Fred Schmidt as a late night supper to satisfy hungry patrons who worked up an appetite trotting across the dance floor. A nice change from the day’s usual late night ham and egg breakfast Chef Schmidt dished and served. The photo shown left is from the hotel. Today, the Kentucky Hot Brown is found throughout the state, with cooks and chefs making their own subtle twists to the original recipe. All good, and not unlike those recipes that surface for Kentucky’s favorite libation, the Mint Julep of which over 120,000 will be downed at Churchill Downs during Derby weekend. 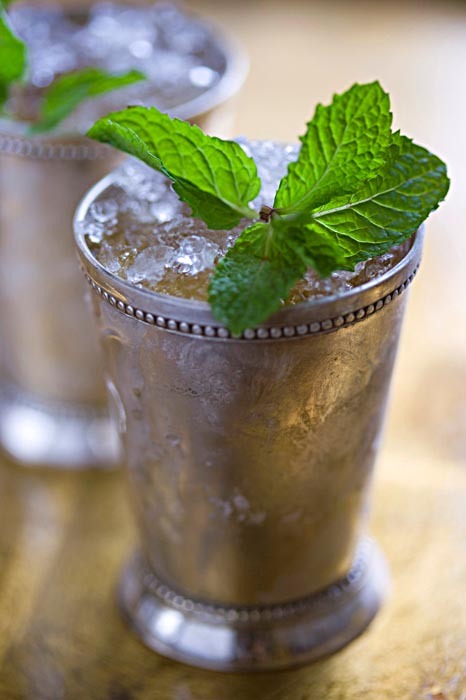 While the Derby serves its juleps in a variety of commemorative glasses, the classic mint julep is traditionally served in a silver cup. The design is based on a pattern created by a 19th century Shelbyville silversmith that featured beaded top and bottom borders. To view such a vintage julep cup take a tour of the Campbell House Museum, located in downtown St. Louis. On display, General U.S. Grant’s silver julep, engraved with the letters U.S.G. The silver cup was kept for the General’s use when visiting the Campbell’s at their St. Louis home. Mint julep connoisseurs still prefer to drink their juleps from silver cups. They’ll also agree the best juleps are made with Kentucky’s famous bourbon. Churchill Down’s juleps are mixed with the Derby’s official bourbon, Woodford Reserve – one of many bourbon brands distilled the Bluegrass State. To discover the variety, I recommend hitting the Bourbon Trail when visiting Kentucky. According to Mike Mangeot, Bardstown-Nelson County Tourism Commission’s executive director, The Kentucky Bourbon Trail currently has ten signature distilleries, and fourteen on the KBT Craft Distillers Trail. This count doesn’t include all of the county’s distillers, such as Bardstown’s historic bourbon distiller, Barton’s/1792. To learn more about Kentucky’s bourbon, plan a visit to the Oscar Getz Museum of Whiskey History in downtown Bardstown, just 45 minutes from Louisville. Take in the exhibits, including its new prohibition exhibit, “Lips That Touch Liquor Shall Not Touch Ours.” The exhibit is on loan from Louisville’s Frazier Museum and will remain at the museum for two years. It illustrates Jazz Age era and shows how millions of otherwise law-abiding Americans chose to violate the national alcohol ban to quench their thirst for illegal booze. Items on displays includes; two full-sized bars, an event-ready Speakeasy with lighted stage, flapper dresses, Prohibition-era “prescriptions,” and a display featuring hatchet-swinging Carry Nation. The Getz Museum also houses The Rickhouse Restaurant. Named in honor of the buildings used to age bourbon, the Rickhouse offers a variety of Kentucky bourbons flights for sampling along with steaks, chops, and of course, the Hot Brown. When researching the julep recipe I found the following information from the Wakefield- Scearce Galleries’ julep cup collection. A letter, written by Lieutenant General Simon Bolivar Buckner, Jr. written to General William D. Connor dated March 30, 1937, the superintendent of the U.S Military Academy at West Point, in regard to the General’s request for the mint julep recipe. The following recipes are Kentucky originals, courtesy of Churchill Downs and The Brown Hotel. To make the simple syrup: In a 1 1/2-quart saucepan combine sugar and water bring to a boil for five minutes. Remove from heat and add a few mint sprigs; cover and cool to room temperature. Keep mint syrup refrigerated until ready to use. In a two-quart saucepan, melt butter and slowly whisk in flour until combined to form a thick paste or roux. Continue to cook roux for 2 minutes over medium-low heat, stirring frequently. Whisk heavy cream into the roux and cook over medium heat until the cream begins to simmer, about 2-3 minutes. Remove sauce from heat and slowly whisk in Pecorino-Romano cheese until the Mornay sauce is smooth. Add nutmeg, salt and pepper to taste. For each Hot Brown, place one slice of toast in an oven safe dish and cover with 7 oz. turkey. Take the two halves of Roma tomato and two toast points and set them alongside the base of turkey and toast. Pour half of the sauce over the dish, completely covering it. Sprinkle with additional cheese. Place entire dish under a broiler until cheese begins to brown and bubble. Remove and cross two pieces of crispy bacon on top. Sprinkle with paprika and parsley and serve immediately.